In honor of LeBron James finally proposing to longtime girlfriend and baby mama Savannah Brinson, Thejerseychaser.com is honoring her as October’s Jersey Chaser of the Month. Brinson has been dating LeBron since high school. She is also the mother of his two children LeBron James Jr. and Bryce Maximus James. The Akron native will stay with her children in Ohio, while LeBron is in Miami during the season. LeBron proposed to Savannah last month, and while no official announcement has been made, Savannah sent out a text message to all of her friends. Girlfriend has put in her time and deserves the rock and the title! 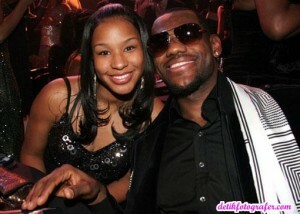 Posted in Bios and tagged Jersey Chaser of the Month, LeBron, Savannah Brinson. Bookmark the permalink.